Our latest sell sheets showcase current design and colour trends in ceramic dinnerware and oven-to-table for the 2017/18 seasons. At Stoneage Ceramics our new release designs are often used as a tool to discuss and inspire potential design themes with clients, showing interesting applications of technique, colour and pattern. Our design team love to be creative and explore the possibilities with new looks and trends and are looking forward to getting ready for our April 2017 release. Please view our current selection of ceramic dinnerware and bakeware sell sheets below, covering a variety of themes including novelty Christmas, formal bone china and winter soup mugs. 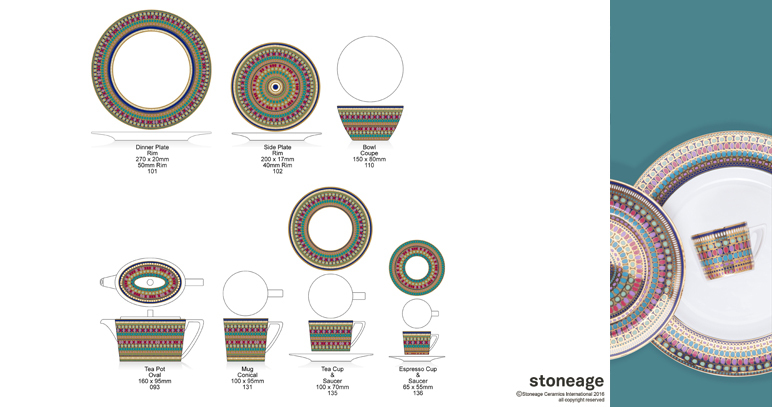 Based on the heavily embellished gold jewels of ancient Egypt and featuring lots of real gold pigment, this highly decorated fine bone china range is Stoneage Ceramics’ latest release in high end dinnerware. On trend colours such as teal, mint and amethyst along with deep red and navy blue look regal against tones of precious gold and metallic mica line work. Angular art deco handles on the hollowware are a feature that compliments the richness of the design and sets this range apart from others on the market. 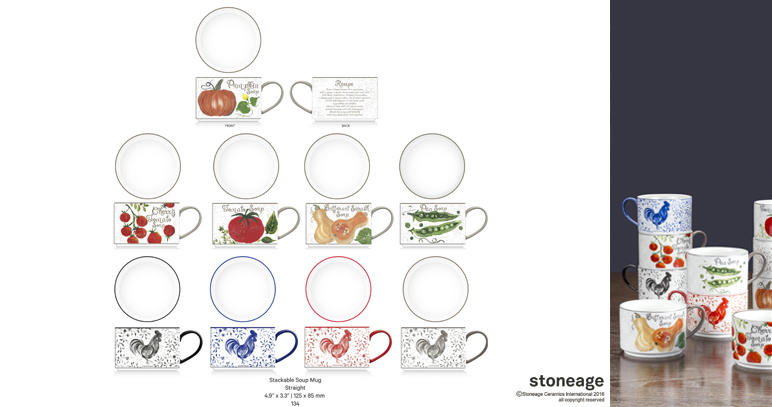 Soup mugs are a great seasonal seller for many of our clients from both the Northern and Southern Hemispheres. It would appear that there are many people out there cozying up with their favourite soup (and soup mug) during those cold winter months. The Harvest collection is our latest instalment of soup mugs for Autumn/Winter 2017 season. Lovingly decorated with hand painted vegetable and rooster designs that give this range a comforting and homely feel. The stackable can shape is convenient for storage and creates an appealing display in-store and at home. An interesting mix of folk inspired cups and bowls, exploring various techniques and finishes on porcelain and stoneware within the same range. 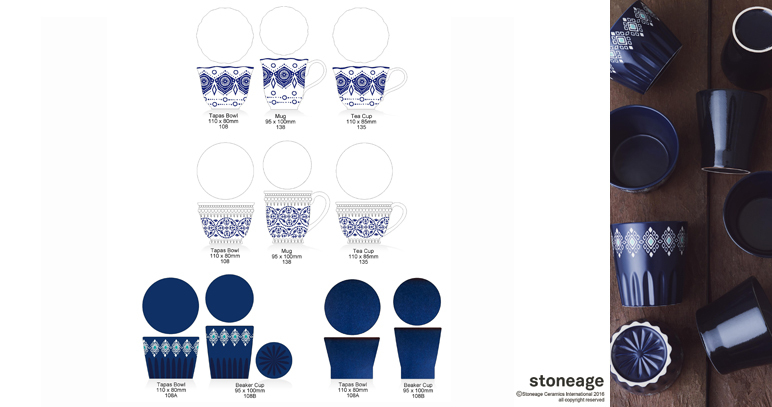 Porcelain teacup, mug and bowl shapes are embellished with embossing and wavy edges and combined with detailed decal patterns. Conical stoneware beaker and tapas bowl shapes use block colour, wax resist, satin and gloss glazes for a bolder look. Rhapsody in Blue is tied together with an indigo colour palette, a theme that remains strong in tabletop and in homewares generally. Our clients are often looking for something new in bakeware, while still being marketable in-store and practical for everyday home use. The Speckle range was designed for the home cook, with soft coupe profiles and open rounded handles creating a charming, homely feel. The patterning is a revival of rustic speckle technique used in traditional pottery, complimented by a soft palette of sandy taupes and on trend minty tones. Each item has a natural unglazed foot, adding a textural element that has been a popular design feature on both bakeware and dinnerware for Autumn/Winter 16/17. This light-hearted range offers a new take on traditional subject matter, aqua blues are used as a fresh alternative to the traditional green, while still maintaining a Christmassy feel. Conversational star and tree shaped pieces and a colourful assortment of mugs and canapé plates create a joyful, festive display. 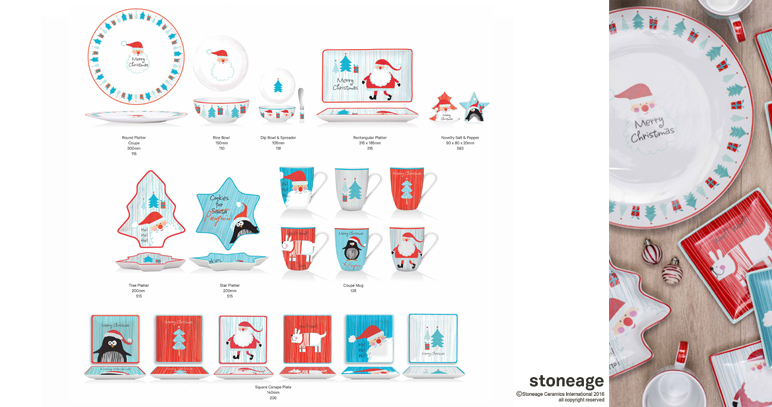 Quirky illustrated characters and a bright colour palette appeal to children and the young at heart, Santa and Friends is a novelty Christmas range that is all about having fun. 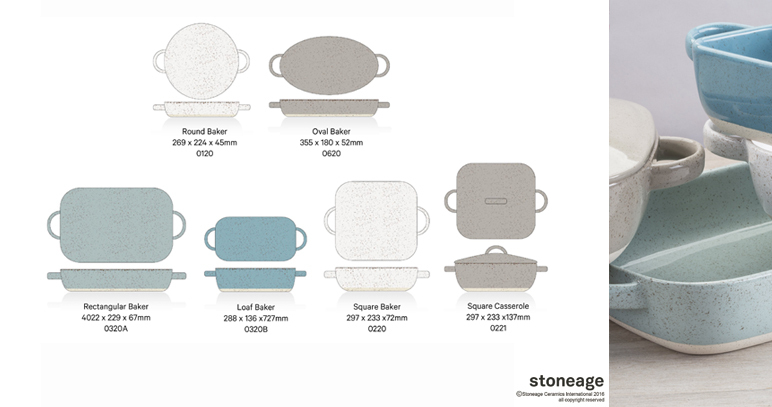 If you are interested in finding out more about our sell sheets or if you would like to discuss your ceramic tableware and dinnerware requirements with us, feel free to get in touch.